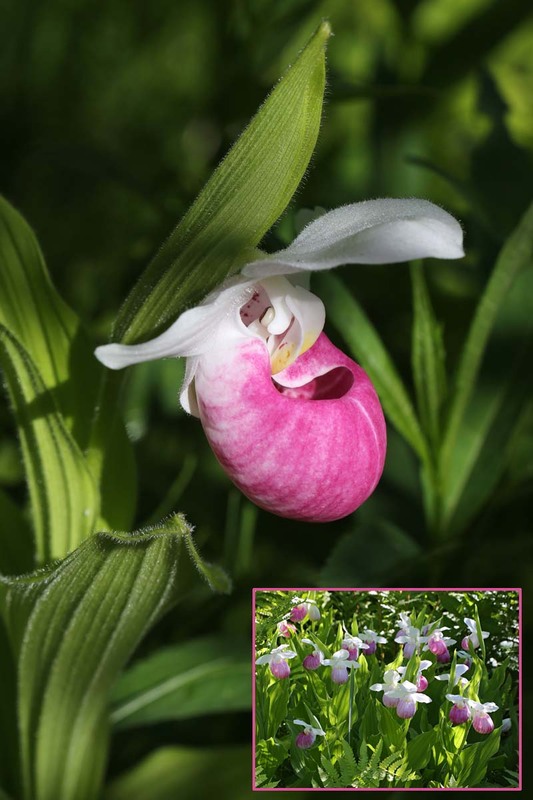 As with Pink and Yellow Lady’s Slippers, one of Showy Lady’s Slipper’s three petals is greatly modified into a large inflated pouch called the labellum. The two other petals attract pollinators with an alluring odor, but the insects that enter into this pouch are in for a disappointment, as lady’s slippers produce little or no nectar. Once inside, visiting insects are guided by very fine, slanting hairs on the inner surface of the pouch towards the flower’s pistil and stamens. Once it has entered the constricted passageway that leads to the reproductive parts, an insect cannot turn around and must pass by the pistil and stamens. Lady’s slippers rarely self-pollinate, so it is crucial that they not only attract, but also extract pollen from insects to achieve cross-pollination. Thanks to their structure, this happens more often than not. The flowering of Showy Lady’s Slippers peaks in Mid-June in central Vermont; if you know of a nearby fen (peat wetland that gets its water from rainfall and surface water), best visit it soon, as that’s where you’re most likely to find this species of orchid.